For the ones not familiar with British news universe, Channel 4 news is the flagship of the evening news for the ones who are interest for global and objective information with plenty of reports and commentaries from al around the world. Channel 4 news hold top ratings in UK and is often awarded for its coverage to important contemporary news. Channel 4 is known for breaking the story of the Iraq Dossier that caused Tony Blair a serious political crisis. “We are ready to open the ovens. We will turn them into soap ... to wash cars and pavements. We will make lamps from their skin.” This is perhaps not one of the most offensive thing you heard in this report from the neo-Nazi party Golden Dawn from Greece; a party that this minutes holds 18 seats in the Greek parliament, 6.9% in the electoral body and according to some surveys they might reach 13% in the next national votes. In most European countries all these parties have managed to veil their real agenda behind the political correct “Euro-sceptics” or "populists" parties. From Le Pen in France to Timo Soini in Finland all of them at least pretend that things are not exactly like that; covering their real face and screaming against EU or the European policy regarding immigrants they always add in the end how much they love ...immigrants. Most of them aware of the political correct and the red lines in Europe they avoid subjects like holocaust and words like multiculturalism avoiding connection with the latest extremist and criminal terrorist incidents like the one in Norway with Anders Behring Breivik. Not in Greece. The Golden Dawn in Greece doesn’t care for the political correct, doesn’t care for cover up, doesn’t care for legality or the constitution. They are out there, saluting like Hitler, screaming hail Hitler in the streets of Athens, terrifying, bulling and threatening anybody who is not to their liking; immigrants, liberals, gays all in the same pot. For them they are the enemy that should be exterminated. And the enemy is we. Is everything that doesn’t fulfil their twisted and criminal stereotypes, whoever doesn’t fulfil their imaginary and criminal stereotypes. 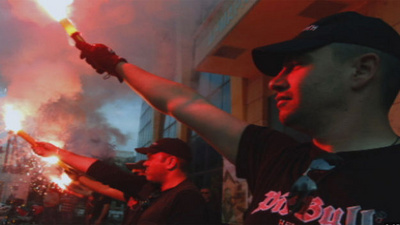 The Greek police is infiltrated from the neo-Nazi’s up to 90%; that was the percent of them that voted Golden Dawn during the last elections. Most of them proudly show their black Golden Dawn t-shirts under their uniforms. Justice is infiltrated since either most of them served as members of court-martials during the dictatorship or they are their sons. The politicians are afraid of the lost votes moving all the time closer to the extreme right hoping to steal some of their votes. In the mean time Mihaloliakos, Kasidiaris, Papas continue their mission. Lately the Golden Dawn opened “educations centres” for minors, seven and eight years-old in the blue-print of Hitler’s youth. The last two years all of us heard and read that the Golden Dawn is a social phenomenon and a result of the Greek economic crisis. The demonstrations in the streets of Athens however violent they get are a social phenomenon and a result of the Greek economic crisis. Golden Dawn is using the social unresting, a result of the Greek economic crisis to rise from the dead, to empower and thrive. Millions of dead all around the world speak for their crimes. Don’t let them do it again. And today they might knock on Greece’s door, tomorrow it might be yours! Anywhere in Greece, Europe or the world. Indeed Thanos, this is quite a disturbing article. It brought me back to Erick Fromm’s Escape from Freedom, a book written all the way back in 1941 but especially relevant today. Twenty years ago when I reminded Europeans of that book and counseled its reading the response was either a polite smile or a rude laugh in my face, as if to imply that I was behind the curve and by now the ultra-democratic EU was around and times like that were gone forever and the book was absolete. I wonder if those people are still laughing today, for if they are it is they who are behind the curve. As you know, in that book Fromm asks two simple questions: could what happened in Germany in the 30s happened in other democratic countries, and what is there within human nature that allow that to happen? He delves into the subject at length and comes up with the conclusion that within human nature there are two urges: the urge to be free and the urge to escape from freedom which derives from the burden and the isolation freedom imposes on the individual who wants to get lost within an amoral sort of organization which will satisfy his urge for community; which is to say many individuals like freedom but see it as to muvh og a burden and responsibility from which they’d rather escape. I think Fromm was on track then, I think he is still on track today. Thanos, thank you for this revelation. Good to see the Devil behind the Masque of the Acceptable. The Nazis weren't the first to ignite these perverse Passions of the Endless Void (certainly not a Golden Dawn). These are but Instant Re-Play Birthers of torturous obscenities and Crimes against All Humanity. Any, and All, Monsters of Anarchy try to distract from their real intentions on the whole by choosing 'special' group targets to launch the Toxic Acids of their Fears, Hatreds and Violence upon (the Jews, the Kurds, the Shiites, the Blacks, the Browns, the Yellows, the Whites, the Immigrants, the Bohemians, the Poor, the Government, Society as a Whole, Anyone who doesn't Think the Way They Do or Look the Way They Do or Act the Way They Do or Speak the Way They Do or Worship the Way They Do...etc.). The People forming militias training for Violence all over the World in order to make themselves feel more empowered through Acts of Violence are all just like this group in Greece. They are All Peoples and Energies of the Endless Void.